By lavender at Aug. 5. 2018. 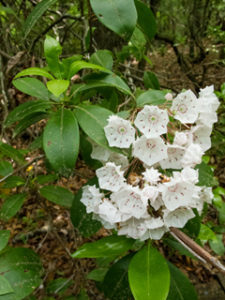 How many of you think that those showy rhododendrons that bloom so gloriously in spring are just a domestic version of our state flower, the mountain laurel? It is a natural assumption as they appear to be very similar and the impulse to use the names interchangeably is understandable. While they are both members of the Ericaceae, each is a different genus. Rhododendrons are of the genus Rhododendron, while mountain laurels are of the genus Kalmia. To put this in perspective The Ericaceae family also encompasses cranberries and blueberries both genus Vaccinium. Some huckleberries are Vaccinium while some are of the genus Gaylussacia. (For those of you who pick our local blueberries/huckleberries the huckleberries of the genus Gaylussacia are the berries that have the larger, crunchy seeds. The ones in our area are usually high bush and have the blacker berries. They also ripen later.) Also in this family among others are trailing arbutus the genus Epigaea, bear berry the genus Arctostaphylos and wintergreen the genus Gaultheria. There is little resemblance between some of these plants, yet all are of the same family. What they have in common is certain characteristics of the flowers. Usually they have 5 petals and 5 sepals which are commonly fused into a bell shaped flower. The produce some sort of berry, drupe (contains only one seed) or seed containing capsule. Most are woody shrubs with alternate leaves that are frequently evergreen. Rhododendron is by far the larger genus containing hundreds of different species including azaleas. Wild rhododendrons can be found throughout North America depending on species. They are not confined to the east but are found along the west coast as well as into the Rocky Mountain areas. 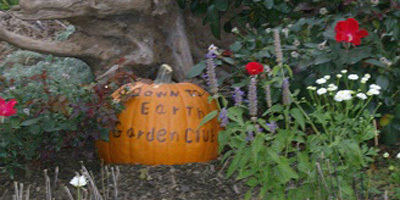 They are usually found in areas where the soil is acidic, rich and moist. They prefer deciduous forests and slopes or mountainous areas where it is cool and shady. There is only one rhododendron that is native to Pennsylvania forests and that is the Rosebay rhododendron (Rhododendron maximum). 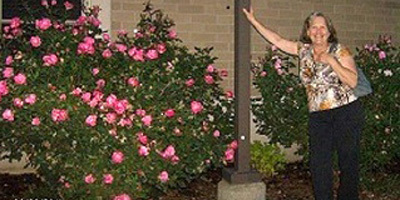 This native rhododendron ranges in height from 5 to 15 feet and has a spread of 5 to 12 feet. It forms dense thickets that are nearly impenetrable. The flowers range from pink to white and form an inflorescence or cluster of flowers around a stem. These terminal clusters contain 10 to 20 bell shaped flowers that frequently have green spots. The leaves are thick and leathery with an often rusty underside. Leaf size ranges from 3 to 14 inches long and 1-3 inches wide with round tips. The leaves are evergreen, with a narrow base and wider middle and rounded tip. They often will curl up under environmental stress. Seed pods are longer than they are wide and ripen from green to brown. Only about 7 species are assigned to the genus Kalmia. One of them is our native mountain laurel. Mountain laurel is a native of the eastern part of the US, particularly the Appalachian region. 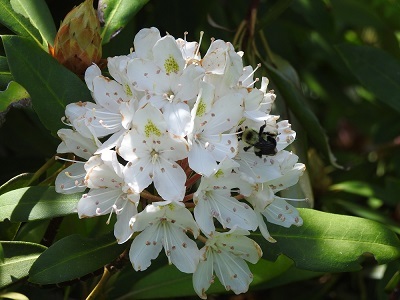 It will grow in dry, rocky or poor soil and is more tolerant of sun than Rhododendron. 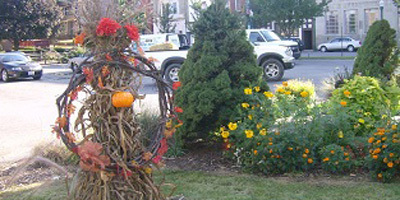 The bushes will range in height from 6 to 15 feet. The flowers are pink or white and are fused forming a bowl shape. A red line circles the center of the blossom. The leaves are oval with a pointed tip. They are two to five inches in length and range from yellow green to dark green and are glossy. The seed pods are round. While in many parts of the country the terms mountain laurel and rhododendron are used interchangeable they are most definitely not the same plant. The rhododendrons that we grow in our garden are no more than a cousin of the wild mountain laurel although they may be a sibling of the wild rhododendron. I will post to FB too!